In video footage, a Prince George’s County, Md., police officer appears to punch and choke a handcuffed man. A four-part video posted on Twitter Saturday appears to show a Prince George's County, Md., police officer punching a handcuffed man. In the first installment of the video, the man can be seen on the ground with the officer on top of him. The officer appears to punch the man in the face. 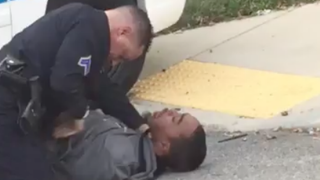 In the second video, the man is on his back with his hands behind him, and the officer appears to push the man's face into the ground. "Oh my God, he can't breathe! You can hear wheezing," a woman off camera notes in the third installment. This version clearly shows that the man is handcuffed. "Relax, you hear those sirens? When they come, you'll be fine," the officer is heard telling the man. The user behind the Twitter handle, who posted the video and asked that he be identified only as Prince, told Addicting Info that the incident happened in Hyattsville, Md. "I've never really seen anything like this firsthand," Prince told the news site. "But I guess I've seen so much of this stuff online that my first instinct was to record it." Prince added that several officers arrived shortly after the last video. Prince George’s County police told Addicting Info that they are aware of the video and are looking into the incident. Read more at Addicting Info.